Types of Briyani - delicious fragrant rice dish from the Moghul origin. There are many types of briyani (also spelled biryani or biriyani). 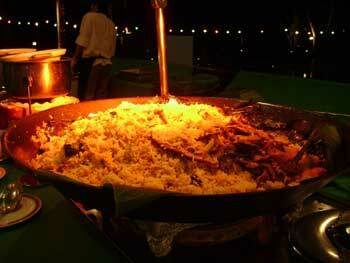 Briyani is an elaborate rice dish from India which came from the influence of the rich tradition of Moghul dynasty. It has many spices, herbs,vegetables and different types of meat or fish added in. Even vegetarian briyani is available. The type of rice used is basmathi. It is fragrant, not starchy, with long grains up to 7mm. You may liken briyani to Middle Eastern pillau or Spanish paella. Local ingredients are used and the cooking method also varies. Sometimes the rice is not par boiled but instead steamed. Or even cooked together with the spices all in one go. It takes skills and practise to make perfect briyani. I should know! My first time making it was almost a disaster. Luckily, one of my friends gave me a handy tip on how to save uncooked rice! In Malaysia, a portion of briyani lunch will cost you around RM7.00 (almost USD2.00). This is considered expensive because the average lunch is around RM3.50 per meal. Since briyani is a rich dish full of cholesterol (especially if lamb or goat meat is used), most people only eat it once in a blue moon. That is, when their pocket is full or to celebrate a special occasion like a wedding. A briyani meal is not complete without the usual condiment including fresh salad, papadom or achar. Wash it down with ice cold rose syrup. Ahhh...nobody will blame you for needing a siesta real soon. In Johore, there is a famous briyani called briyani gam. I am not sure what "gam" means in this dish but in Malay, it literally means "glue" (?). 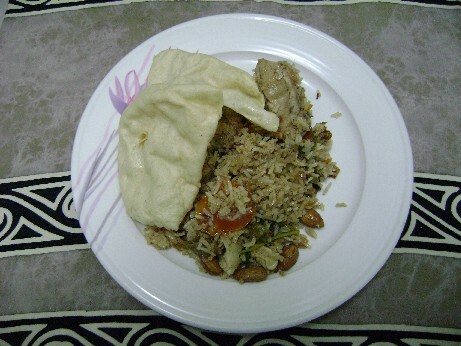 However, this time we are not going to do briyani gam but instead I am going to show you step by step a briyani dish taught by a Pakistani male cook who came for a visit in Penang last year (2006).